Jim: I've got to go. Helen: Can't you tell me where you're going? Will you write? Do you need any money? But you must, Jim. How do you live? I Am a Fugitive from a Chain Gang changed minds and influenced attitudes like no other Hollywood film before it, and proved cinema could be a powerful instrument for righting society's wrongs. Seventy-three years have passed since this landmark film first premiered, yet remarkably it retains its visceral punch, despite depicting and condemning an almost archaic form of punishment. (I say "almost," because, unbelievably, a few correctional facilities have recently resurrected this primitive practice.) Yet back in 1932, shackles and leg irons were part of standard prison attire in many Southern institutions, which sought to dehumanize and browbeat inmates rather than rehabilitate them. Mervyn LeRoy's gritty film and Paul Muni's bravura performance illuminated the issue, which in turn prompted public outrage, an investigation into human rights violations in the prison system, and the birth of a new Hollywood genre. Before I Am a Fugitive, the movies rarely addressed social issues other than gangsters and Prohibition. Warner Bros. led the charge, carving a niche with stark, cautionary tales about common men who turn to crime to escape economic hardship. On the surface, I Am a Fugitive might seem like just another assembly line entry, but the nuanced script delves deeper, exploring hitherto uncharted themes (such as the plight of returning war veterans), and achieving a level of somber realism unique to Depression era films. The uncertain ending�which leaves Muni's character in agonizing limbo�strikingly veers far away from the blaze-of-glory finales Warner favored during the early 1930s, and, as a result, remains arguably the most powerful cinematic finish of the period. Based on the autobiography of Robert Burns�who, according to an internal Warner memo, used an assumed name when he came to Hollywood to work on the screenplay, because Georgia authorities still pursued him�I Am a Fugitive from a Chain Gang tells the gut-wrenching story of James Allen (Muni), a disillusioned veteran who can't stomach returning to his old factory job after serving in World War I. Jim dreams of becoming an engineer, and sets out to find work in his chosen field, against the advice of his brother, Robert (Hale Hamilton), a sanctimonious preacher. Pickings, however, are slim, and Jim knocks around the country, making a few pennies here and there, before a chance encounter with a fellow bum (Preston Foster) in a flophouse leads to a botched robbery. Although Jim was an unwilling accomplice with no prior criminal record, and stole only five dollars, the judge at his trial rejects a leniency plea and slaps Jim with a six-to-ten stretch on the chain gang. The abusive guards try to break Jim's spirit without success, and after witnessing the horrific toll the hellish environment exacts on his fellow inmates, he plots his escape. Jim narrowly evades an army of guards and bloodhounds as he races through swamps and brush, then flees to Chicago, changes his name to Allen James, and begins life anew. He becomes a model citizen and respected civil engineer, but spends his life constantly looking over his shoulder and averting his eyes whenever he sees a cop on the stroll. His comely yet brassy landlord, Marie (Glenda Farrell), discovers his secret and blackmails him into marriage, but when Jim falls in love with Helen (Helen Vinson), a wealthy socialite, and asks for a divorce, Marie turns vindictive and throws a boulder at Jim's glass house. Once seen, I Am a Fugitive from a Chain Gang is not easily forgotten. The film brilliantly depicts the prison's deplorable conditions�the back-breaking labor, ramshackle barracks, revolting food, and brutal punitive beatings�and how the guards treat the inmates like a subhuman life form, seizing every opportunity to crush the last vestiges of their dignity. (The convicts even have to ask permission to wipe the sweat off their brows on the rockpile.) The scenes still pack quite a wallop today, thanks to LeRoy's coarse, realistic style, which immerses us in the chain gang culture. The pacing never drags, and the escape scenes bristle with tension and suspense. Muni's natural acting style lends his character an essential everyman quality, and the star masterfully captures all of Jim's conflicting emotions�itchy malcontent early in the film, then fear, exhaustion, revulsion, outrage, paranoia, and, ultimately, the tragic realization that either bound or unbound, he will always be in chains. Haunted by an inbred insecurity over his appearance, Muni hid under thick layers of makeup for a series of prestigious biopics, but his naked face in I Am a Fugitive allows us to peer into Jim's soul, and create an intimate rapport with the character. A few reaction shots are a bit stagy, but Muni's performance holds up extremely well�a tribute to this fine actor's meticulous craftsmanship, and the film's unwavering quality. Image Transfer Review: I Am a Fugitive from a Chain Gang is seven decades old, yet the wizards at Warner Home Video have fashioned a superb transfer that shaves years off the movie's age. Most of the specks and scratches have been erased, leaving a sharp image enhanced by light grain and well-modulated gray levels. Rich blacks, excellent contrast, and solid shadow detail add luster to this stark film, and close-ups possess marvelous clarity. Some of the outdoor location scenes look a tad washed out, but that's largely due to the technical limitations of the time. Audio Transfer Review: Once again, Warner has done wonders with this antiquated track. The mono audio possesses very little surface noise for a film of this vintage, and the clear, easily understandable dialogue rarely sounds tinny or shrill. Action scenes enjoy a strong bass presence, and a robust chain gang spiritual nicely fills the room. Extras Review: In addition to the original theatrical trailer, a couple of noteworthy supplements flesh out the disc. First up is an informative commentary from film historian Richard B. Jewell, who effectively compares the story of real-life fugitive Robert Burns with his fictional counterpart. Jewell addresses the changes Warner Bros. made to the story, and how the movie struck a chord with Depression-era audiences, who felt a kinship with James Allen's plight. He also discusses the history of Georgia's chain gang system, the picture's anti-Southern slant, and points out which scenes were shot on recycled sets from other Warner productions. A few gaps break up the commentary's flow, but Jewell's enthusiasm and cogent points hold our interest. 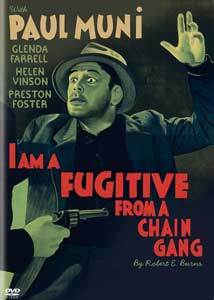 The short 20,000 Cheers for the Chain Gang spoofs two of Warner's most popular prison dramas of the day�I Am a Fugitive and 20,000 Years in Sing Sing�while also taking a few pointed jabs at director Busby Berkeley. The plot concerns the tough-minded warden of a Southern chain gang, who, after learning a committee will be investigating the appalling conditions at his prison, decides to pull the wool over the inspectors' eyes by "redecorating" the barracks, improving the food, and hiring a bevy of dancing girls to entertain the inmates in the mess hall. The stunt works so well and receives such positive press, a quintet of knucklehead convicts who recently escaped from the joint fall hook, line, and sinker for the scam. They come to believe life on the inside sure beats the nagging wives and everyday pressures of life on the outside, and they hatch a scheme to break back into prison! Though incredibly silly (and a little tasteless), the 20-minute short possesses some amusing moments and a gleefully irreverent tone. It's too bad, however, that a featurette about I Am a Fugitive and Paul Muni is not included on the disc. An incisive indictment of America's justice and penal systems, I Am a Fugitive from a Chain Gang remains one of Hollywood's most powerful social issue pictures. Paul Muni's emotionally charged portrayal of a wrongly convicted man who can never escape the indignities thrust upon him endures as one of the screen's great performances, and Mervyn LeRoy's taut direction makes the film entertaining as well as affecting. Warner provides top-quality image and audio transfers, and a couple of interesting extras. Highly recommended.